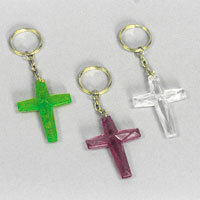 Plastic crosses on a keychain. 144 pieces per gross. $17.60 per gross for 5 gross or more. $15.66 per gross for 15 gross or more.